An Advanced Gas-cooled Reactor (AGR) is a type of nuclear reactor designed and operated in the United Kingdom. These are the second generation of British gas-cooled reactors, using graphite as the neutron moderator and carbon dioxide as coolant. They have been the backbone of the UK's nuclear generation fleet since the 1980s. The AGR was developed from the Magnox reactor, the UK's first-generation reactor design. The first Magnox reactors had been optimised for generating plutonium, and for this reason it incorporated a number of features that are not necessarily the best for economic performance. Primary among these requirements was the Magnox's ability to run on natural uranium, which demanded the use of a coolant with a low neutron cross section, in this case CO2, and efficient neutron moderator, graphite. Magnox also ran relatively cool compared to other power-producing designs, which made it less efficient extracting power from the reactor core. The AGR retained the Magnox's graphite moderator and CO2 coolant but increased its operating temperature to improve efficiency when converted to steam. The steam it produced was deliberately identical to that from a coal fired plant, allowing the same turbines and generation equipment to be used. During the initial design stages the system was forced to switch the tubing enclosing the fuel pellets from beryllium to stainless steel. Steel has a higher cross section and this change demanded the switch to enriched uranium fuel to maintain criticality. As part of this change, the new design had higher burnup of 18,000 MWt-days per tonne of fuel, requiring less frequent refuelling. The first prototype AGR became operational in 1962, but the first commercial AGR did not come online until 1976. A total of fourteen AGR reactors at six sites were built between 1976 and 1988. All of these are configured with two reactors in a single building. Each reactor has a design thermal power output of 1,500 MWt driving a 660 MWe turbine-alternator set. The various AGR stations produce outputs in the range 555 MWe to 670 MWe though some run at lower than design output due to operational restrictions. 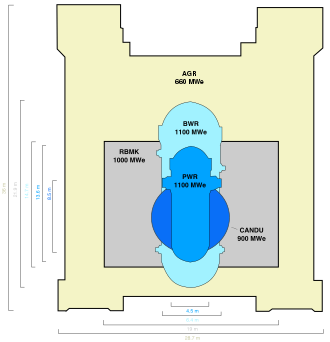 Schematic diagram of the Advanced Gas-cooled Reactor. Note that the heat exchanger is contained within the steel-reinforced concrete combined pressure vessel and radiation shield. The design of the AGR was such that the final steam conditions at the boiler stop valve were identical to that of conventional coal-fired power stations, thus the same design of turbo-generator plant could be used. The mean temperature of the hot coolant leaving the reactor core was designed to be 648 °C. In order to obtain these high temperatures, yet ensure useful graphite core life (graphite oxidises readily in CO2 at high temperature) a re-entrant flow of coolant at the lower boiler outlet temperature of 278 °C is utilised to cool the graphite, ensuring that the graphite core temperatures do not vary too much from those seen in a Magnox station. The superheater outlet temperature and pressure were designed to be 2,485 psi (170 bar) and 543 °C. The fuel is uranium dioxide pellets, enriched to 2.5-3.5%, in stainless steel tubes. The original design concept of the AGR was to use a beryllium based cladding. When this proved unsuitable due to brittle fracture, the enrichment level of the fuel was raised to allow for the higher neutron capture losses of stainless steel cladding. This significantly increased the cost of the power produced by an AGR. The carbon dioxide coolant circulates through the core, reaching 640 °C (1,184 °F) and a pressure of around 40 bar (580 psi), and then passes through boiler (steam generator) assemblies outside the core but still within the steel-lined, reinforced concrete pressure vessel. Control rods penetrate the graphite moderator and a secondary system involves injecting nitrogen into the coolant to absorb thermal neutrons to stop the fission process if the control rods fail to enter the core. A tertiary shutdown system which operates by injecting boron beads into the reactor is included in case the reactor has to be depressurized with insufficient control rods lowered. This would mean that nitrogen pressure cannot be maintained. The AGR was designed to have a high thermal efficiency (electricity generated/heat generated ratio) of about 41%, which is better than modern pressurized water reactors which have a typical thermal efficiency of 34%. This is due to the higher coolant outlet temperature of about 640 °C (1,184 °F) practical with gas cooling, compared to about 325 °C (617 °F) for PWRs. However the reactor core has to be larger for the same power output, and the fuel burnup ratio at discharge is lower so the fuel is used less efficiently, countering the thermal efficiency advantage. Like the Magnox, CANDU and RBMK reactors, and in contrast to the light water reactors, AGRs are designed to be refuelled without being shut down first (see Online refuelling). This on-load refuelling was an important part of the economic case for choosing the AGR over other reactor types, and in 1965 allowed the Central Electricity Generating Board (CEGB) and the government to claim that the AGR would produce electricity cheaper than the best coal-fired power stations. However fuel assembly vibration problems arose during on-load refuelling at full power, so in 1988 full power refuelling was suspended until the mid-1990s, when further trials led to a fuel rod becoming stuck in a reactor core. Only refuelling at part load or when shut down is now undertaken at AGRs. The pre-stressed concrete pressure vessel contains the reactor core and the boilers. To minimise the number of penetrations into the vessel (and thus reduce the number of possible breach sites) the boilers are of the once through design where all boiling and superheating is carried out within the boiler tubes. This necessitates the use of ultra pure water to minimise the buildup of salts in the evaporator and subsequent corrosion problems. The AGR was intended to be a superior British alternative to American light water reactor designs. It was promoted as a development of the operationally (if not economically) successful Magnox design, and was chosen from a multitude of competing British alternatives - the helium cooled High Temperature Reactor, the Steam Generating Heavy Water Reactor and the Fast Breeder Reactor - as well as the American light water pressurised and boiling water reactors (PWR and BWR) and Canadian CANDU designs. The CEGB conducted a detailed economic appraisal of the competing designs and concluded that the AGR proposed for Dungeness B would generate the cheapest electricity, cheaper than any of the rival designs and the best coal-fired stations. There were great hopes for the AGR design. An ambitious construction programme of five twin reactor stations, Dungeness B, Hinkley Point B, Hunterston B, Hartlepool and Heysham was quickly rolled out, and export orders were eagerly anticipated. However, the AGR design proved to be over complex and difficult to construct on site. Notoriously bad labour relations at the time added to the problems. The lead station, Dungeness B was ordered in 1965 with a target completion date of 1970. After problems with nearly every aspect of the reactor design it finally began generating electricity in 1983, 13 years late. The following reactor designs at Hinkley Point and Hunterston significantly improved on the original design and indeed were commissioned ahead of Dungeness. The next AGR design at Heysham 1 and Hartlepool sought to reduce overall cost of design by reducing the footprint of the station and the number of ancillary systems. The final two AGRs at Torness and Heysham 2 returned to a modified Hinkley design and have proved to be the most successful performers of the fleet. Former Treasury Economic Advisor, David Henderson, described the AGR programme as one of the two most costly British government-sponsored project errors, alongside Concorde. When the government started on privatising the electricity generation industry in the 1980s, a cost analysis for potential investors revealed that true operating costs had been obscured for many years. Decommissioning costs especially had been significantly underestimated. These uncertainties caused nuclear power to be omitted from the privatisation at that time. The small-scale prototype AGR at Sellafield (Windscale) has been decommissioned as of 2010 – the core and pressure vessel decommissioned leaving only the building "Golf Ball" visible. This project was also a study of what is required to decommission a nuclear reactor safely. In October 2016 it was announced that super-articulated control rods would be installed at Hunterston B and Hinkley Point B because of concerns about the stability of the reactors' graphite cores. The Office for Nuclear Regulation (ONR) had raised concerns over the number of fractures in keyways that lock together the graphite bricks in the core. An unusual event, such as an earthquake, might destabilise the graphite so that ordinary control rods that shut the reactor down could not be inserted. Super-articulated control rods should be insertable even into a destabilised core. In early 2018 a slightly higher rate of new keyway root cracks than modelled was observed in Hunterston B Reactor 3 during a scheduled outage, and EDF announced in May 2018 that the outage would be extended for further investigation, analysis and modelling. In 2018 inspections ordered by the ONR at Dungeness B showed that seismic restraints, pipework and storage vessels were "corroded to an unacceptable condition", and that would have been the state when the reactor was operating. The ONR classified this as a level 2 incident on the International Nuclear Event Scale. In 2005 British Energy announced a 10-year life extension at Dungeness B, that will see the station continue operating until 2018, and in 2007 announced a 5-year life extension of Hinkley Point B and Hunterston B until 2016. Life extensions at other AGRs will be considered at least three years before their scheduled closure dates. From 2006 Hinkley Point B and Hunterston B have been restricted to about 70% of normal MWe output because of boiler-related problems requiring that they operate at reduced boiler temperatures. In 2013 these two stations' power increased to about 80% of normal output following some plant modifications. In 2006 AGRs made the news when documents were obtained under the Freedom of Information Act 2000 by The Guardian who claimed that British Energy were unaware of the extent of the cracking of graphite bricks in the cores of their reactors. It was also claimed that British Energy did not know why the cracking had occurred and that they were unable to monitor the cores without first shutting down the reactors. British Energy later issued a statement confirming that cracking of graphite bricks is a known symptom of extensive neutron bombardment and that they were working on a solution to the monitoring problem. Also, they stated that the reactors were examined every three years as part of "statutory outages". On 17 December 2010, EDF Energy announced a 5-year life extension for both Heysham 1 and Hartlepool to enable further generation until 2019. In February 2012 EDF announced it expects 7 year life extensions on average across all AGRs, including the recently life-extended Heysham 1 and Hartlepool. These life extensions are subject to detailed review and approval, and are not included in the table above. On 4 December 2012 EDF announced that Hinkley Point B and Hunterston B had been given 7 year life extensions, from 2016 to 2023. On 5 November 2013 EDF announced that Hartlepool had been given a 5-year life extension, from 2019 to 2024. In 2013 a defect was found by a regular inspection in one of the eight pod boilers of Heysham reactor A1. The reactor resumed operation at a lower output level with this pod boiler disabled, until June 2014 when more detailed inspections confirmed a crack in the boiler spine. As a precaution Heysham A2 and the sister Hartlepool station were also closed down for an eight weeks' inspection. In October 2014 a new kind of crack in the graphite moderator bricks was found at the Hunterston B reactor. This keyway root crack has been previously theorized but not observed. The existence of this type of crack does not immediately affect the safety of a reactor – however if the number of cracks exceed a threshold the reactor would be decommissioned, as the cracks cannot be repaired. In January 2015 Dungeness B was given a ten-year life extension, with an upgrade to control room computer systems and improved flood defences, taking the accounting closure date to 2028. In February 2016, EDF extended the life of four of its eight nuclear power plants in the UK. Heysham 1 and Hartlepool will have their life extended by five years until 2024, while Heysham 2 and Torness will see their closure dates pushed back by seven years to 2030. ^ Gilbert, Richard J.; Kahn, Edward P. (18 January 2007). International Comparisons of Electricity Regulation. Cambridge University Press. p. 47. ISBN 9780521030779. Retrieved 6 October 2017. ^ History of Windscale's Advanced Gas-cooled Reactor Archived 1 October 2011 at the Wayback Machine, Sellafield Ltd.
^ John Bryers, Simon Ashmead (17 February 2016). "Preparation for future defuelling and decommissioning works on EDF Energy's UK fleet of Advanced Gas Cooled Reactors" (PDF). PREDEC 2016. OECD Nuclear Energy Agency. Retrieved 18 August 2017. ^ Murray, P. (1981). "Developments in oxide fuels at Harwell". Journal of Nuclear Materials. 100 (1–3): 67–71. Bibcode:1981JNuM..100...67M. doi:10.1016/0022-3115(81)90521-3. ^ a b c Owen, Geoffrey (7 March 2016). "Book review: 'The Fall and Rise of Nuclear Power in Britain'". Financial Times. Retrieved 16 March 2016. ^ S H Wearne, R H Bird (December 2016). "UK Experience of Consortia Engineering for Nuclear Power Stations" (PDF). Dalton Nuclear Institute, University of Manchester. Retrieved 25 March 2017. ^ Henderson, David (21 June 2013). "The more things change..." Nuclear Engineering International. Retrieved 2 July 2013. ^ "Nuclear reactor cracks 'challenge safety case'". BBC News. 31 October 2016. Retrieved 31 October 2016. ^ "New cracks delay restart of Hunterston B reactor". World Nuclear News. 3 May 2018. Retrieved 6 May 2018. ^ "Dungeness B corrosion rated at INES level 2". Nuclear Engineering International. 24 January 2019. Retrieved 30 January 2019. ^ "United Kingdom of Great Britain and Northern Ireland: Nuclear Power Reactors". PRIS database. International Atomic Energy Agency. 22 May 2010. Archived from the original on 28 June 2011. Retrieved 22 May 2010. ^ "10-year life extension at Dungeness B nuclear power station". British Energy. 15 September 2005. Archived from the original on 22 March 2006. Retrieved 19 June 2008. ^ "Hinkley Point B and Hunterston B return to 80% load". Nuclear Engineering International. 1 July 2013. Retrieved 2 July 2013. ^ "BBC NEWS - UK - Reactor crack fears played down". news.bbc.co.uk. ^ "EDF plans longer life extensions for UK AGRs". Nuclear Engineering International. 20 February 2012. Archived from the original on 13 October 2013. Retrieved 16 May 2012. ^ "Doosan Babcock signs EDF deal to extend nuclear plants". BBC. 19 February 2014. Retrieved 19 February 2014. ^ "EDF extends life of two nuclear power stations". The Independent. 4 December 2012. Retrieved 14 August 2013. ^ "Hartlepool power station to stay open until 2024". BBC. 5 November 2013. Retrieved 19 February 2014. ^ "EDF Energy shuts Heysham A1&2 and Hartlepool for pod boiler inspections". Nuclear Engineering International. 11 August 2014. Retrieved 14 August 2014. ^ "UK regulator backs EDF Energy on reactor checks". World Nuclear News. 13 August 2014. Retrieved 14 August 2014. ^ Broomby, Rob. "New cracks in Hunterston reactor". BBC News. British Broadcasting Corporation. Retrieved 6 October 2014. ^ "Concerns Persist Over Safety of Cracking Inside Reactor in Scotland: Nuclear Safery Expert". RIA Novosti. 7 October 2014. Retrieved 10 October 2014. ^ "UK nuclear plant gets ten-year extension". World Nuclear News. 20 January 2015. Retrieved 21 January 2015. ^ Moylan, John (2016). "EDF to keep four UK nuclear plants open for years longer". BBC. This page was last edited on 10 March 2019, at 15:54 (UTC).